"In the first 1,000 years after Christ, merchants, missionaries, monks, mendicants and military men travelled on the vast network of Central Asian tracks that became known as the SILK ROAD . Linking Europe, India and the Far East, the route passed through many countries and many settlements, from the splendid city of Samarkand to tiny desert hamlets. Sogdian merchants traded in Baltic amber, lapis from Afghanistan, silk from China and wool from the Mongolian steppes; itinerant Buddhist monks, Persian Manichaean priests, Zoroastrians, and Nestorian Christians sought converts among the desert settlers; storytellers, acrobats, musicians, dancers, courtesans, diviners, pedlers and miracle-workers offered their wares in the marketplaces and temple fairs." TAXILA (Pakistan) thrived from around 3000 BC to the 16th century. Excavations have so far revealed three distinct cities, the earliest dating from around 180 BC To the north-east is Sirkup originally built by the Bactrian Greeks, followed by the Scythians, Parthians, and later by the Kushans, who transformed it into the great centre of the Gandhara culture. It eventually became the Buddhist 'Holy Land'. 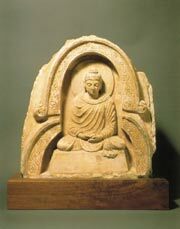 The museum houses a magnificent collection of Gandhara busts of the Buddha, the period which produced a style of art which evolved out of the fusion of Graeco-Roman and Indian art forms and which so influenced the early Chinese Buddhist iconography. After flying to Urumqi, capital city of Xinjiang Province, in western China we will drive to the oasis of TURPAN. Visit the ruins of Jiaohe, a garrison town in the Han Dynasty and Gaochang, capital of the Uighurs (a Turkic people who still inhabit this area of China) when they moved into the Xinjiang region from Mongolia in the 9th century. The town was originally founded during the Tang Dynasty when it was a major staging post along the Silk Road. Heading westwards past Bosten Lake and a possible visit to the Tibetan Buddhist Monastery of Baluntai, towards KORLA and KUQA where many Buddhist cave complexes may be found. The Chinese monk Xuan Zang who passed through the city in the 7th century mentioned that the city's western gate was flanked by two 30 metre high Buddhist statues and that thee were numerous Buddhist monasteries dotted with beautiful frescoes. Here may also be found Molana Eshdings tomb, he is credited with being the first Islamic missionary from the Middle East to visit Kuqa. On the southern boundary of the Taklamakan Desert lies KHOTAN in one of the remotest parts of Xinjiang. Nearby are the ruins of Yurturgan, the ancient capital of a pre- Islamic kingdom dating from 3rd - 8th centuries. Khotan is renowned for its precious stones and its jade is considered the best in China. In Jiyaxiang hand-woven carpets are still made on traditional looms. 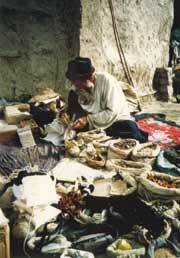 We shall be in Khotan for the Sunday Market when people come down from the surrounding villages to sell their wares. The MAGAO CAVES OF DUNHUANG are the best preserved examples of Buddhist cave art in China. According to legend, in 366 AD the vision of a thousand Buddhas inspired a wandering monk to cut the first of hundreds of caves into the sand- stone cliff face. Over the next ten centuries Dunhuang became a flourishing centre of Buddhist culture along the Silk Road. A fitting end to a magnificent journey.